Jan Tschichold’s “The New Typography” was first published in 1928 in Germany and in a way became a modern typography manifesto. This very thorough and fascinating work studies numerous theories from social criticism and art history to emerging importance of photography in graphic design. On top of this, the author clearly sets very definite guidelines for the printed material design. 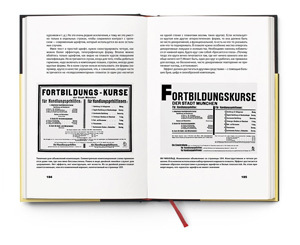 The final chapters provide practical instructions on preparing everyday documents, down to choosing the paper size and appropriate typefaces combination. Though the standards from the book are out of date and out of use, and the author himself later disowned some of the statements and ideas, “The New Typography” remains one of the 20th century’s most significant books dedicated to typography and graphic design. This book is essential for graphic designers, type designers, illustrators, typesetters, and others interested in graphic and type design history.